What are the Storage and Stability recommendations for your proteins and antibodies? Proteins comprise a heterogeneous class of macromolecules that are often unstable during storage. If appropriate buffer conditions are not maintained, proteins may become insoluble or function improperly. Proteins can lose activity as a result of suboptimal buffer conditions, proteolysis, or aggregation. In the laboratory, purified proteins usually need to be stored for extended periods of time and need to retain their original activity and structural integrity. The stability of proteins can vary from a few days to more than a year and is dependent on the nature of the protein and storage conditions. Optimal conditions for storage are distinctive to each protein. Some proteins and monoclonal antibodies are typically stored in solution at 4°C but must be kept sterile or contain additives to prevent microbial or proteolytic degradation. Anti-microbial agents such as 0.1% sodium azide (NaN3) or 0.01% thimerosal inhibit microbial growth. Metal chelators such as 1-5 mM EDTA avoid metal-induced oxidation of –SH groups and help to maintain the protein in a reduced state. The reducing agent dithiothreitol (DTT) at 1-5 mM can help to maintain the protein in the reduced state by preventing formation of intramolecular and intermolecular bonds between cysteine residues. Freezing at -20°C or -80°C is the most common form of cold protein storage. However, because freeze-thaw cycles decrease protein stability, samples need to be prepared in single-use aliquots so that, once thawed, the sample will not have to be refrozen. Another method to increase stability is the addition of 25-50% glycerol which will prevent freezing at -20°C. This allows the repeated use of a protein from a single stock without thawing. Lyophilization allows for long-term storage of protein with little threat of degradation and has become one of the most common methods for manufacture for recombinant proteins. It has the advantage that vials may be stored for extended periods of time before reconstitution. However, the protein still must be reconstituted before use, and once it is reconstituted, the protein needs to be aliquoted and frozen like a liquid formulation. What is the biological activity of my protein? The biological activity of a protein is routinely measured using a bioassay such as a cell proliferation assay or enzyme assay. Due to a protein’s ability to exert multiple biological activities with different cells, several different assays may exist for a particular protein. Because different cell types have different responses to a particular protein, the activity as determined by different cells and assays may vary depending on the manufacturer. The usual method of measuring biological activity of a recombinant protein is by determining the 50% effective dose (ED50). The ED50 is the concentration of protein that is necessary to generate 50% of the maximum dose observed in a dose response titration. 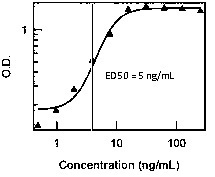 ED50 is most applicable to proteins with sigmoid activity curves where the 50% concentration value can be easily identified, as in the example below. The ED50 value lets you know that the protein has been tested in a manner that is biologically relevant. It also gives you a starting place for your experiments. However, the user still needs to find the optimal concentrations (and even ED50) for their assay. The ED50 also establishes quantitative criteria for the side-by-side comparison of two batches of proteins. This allows the manufacturer to ensure lot to lot consistency, but it may not represent user biological activity under different experimental conditions. Finally, the ED50 may also be used to compare the activity of proteins from different manufacturers who use the same assay. How is Specific Activity related to Biological Activity? For some proteins, e.g. cytokines, each lot is manufactured according to a minimum specification, so the user can always be assured that the product meets the specification on the datasheet. For proteins like enzymes, the specific activity determined for each lot is usually reported on the lot specific datasheet that is shipped with each product. The lot number on the vial is the same as on the datasheet. What is the difference between laboratory (observed) units and international units? Laboratory units are the actual values obtained from running an assay with a particular protein in an assay in the lab; i.e., the activity (ED50) observed with target cells. International units (IU) are the amount of protein that produces a specified effect when tested according to an internationally accepted biological procedure. It is unlikely that units determined in the lab will correlate with international units. Using IU as a measure of the activity of a protein during manufacture provides the customer with comparing the activity of the product to that of other suppliers. What is the difference between an ELISA Kit and an ELISA Pair? Cell Sciences offers a variety of ELISA formats for the detection of proteins in solution. Complete Kits with pre-coated plates are the most user-friendly assays, have been validated in the laboratory, and include the capture antibody already coated on the plate. In addition, they also include the detecting antibody, standards, and most of the other reagents and solutions necessary to carry out the ELISA. Some ELISA kits are supplied without pre-coated plates and the user coats the plate as the first step of the assay. ELISA pairs (e.g., ELI-pairs) are multi-reagent products that include the capture antibody, detection antibody, and standards. Other reagents may be included, but solutions and substrates are usually not included. For some ELISA assays, the capture or detection antibody may also be available as stand-alone items. Many of the kits use monoclonal antibodies as both the capture and detection antibody and are available as individual products. Some of these antibodies are also available in flow cytometry format (formulated by the number of tests) or conjugated with FITC or PE. What is the best method to analyze ELISA data from the standard curve? Analysis of ELISA data consists of plotting OD450values of the standards against the amount of protein. Typically, a straight line can be plotted through the linear points of the standard curve using a linear fit procedure. This may be necessary if the user does not have access to ELISA standard curve software. However, titration data from most immunoassays is actually sigmoidal rather than linear, and the linear portion of the standard values may not include the lowest and highest points. For a closer fit, we recommend a 4-parameter curve fit as the best method to analyze ELISA data. Most spectrophotometers are equipped with software to perform a 4-parameter fit, and the data can also be analyzed with statistical software packages such a SigmaPlot. The 4-parameter analysis gives the most accurate determinations of the lowest and highest values which deviate from a straight line as they approach the minimum and maximum values. The graph below shows a four parameter logistic curve for values with a wider range of concentrations than typically used for an ELISA. The four parameters are 1) the minimum, 2) the maximum, 3) the half-maximal effective concentration (EC50), and 4) the Slope at the EC50. The EC50is the x-axis value for the curve point that is midway between the max and min parameters. The slope at the midpoint has a large value if the curve is steep and a small value if the curve is shallow. Most ELISAs have a positive slope with an increasing curve. What is a Functional ELISA Assay? Functional assays are not produced with a capture antibody, which would bind all the protein in solution, but with the ligand/binding protein which binds only the functionally active proteins and leaves the latent or complexed protein in solution in the well. Some examples include the PAI-1, tPA, and uPA ELISA kits. Western blotting is a technique that separates proteins based on size. In general, the smaller the protein the faster it migrates through the gel. However, migration is also affected by other factors, so the actual band size observed may differ from that predicted. The band may differ for a number of different reasons. One of the most common factors is post-translational modification such as glycosylation, which increases the size of the protein. This is commonly seen with recombinant proteins made in insect cells or human cell culture. Some proteins form dimers and show at a higher molecular weight. Other factors include splice variants or relative charge, where the altered size or charge can affect protein migration. Why are some products discontinued? A product is sometimes discontinued. This can be for several reasons, such as decreased customer demand, unavailability from the originator, or production difficulties. We understand the inconvenience this causes customers, particularly if it is a product they have been using for some time. If we have an alternative or replacement, we will provide the catalog number and send you a datasheet.